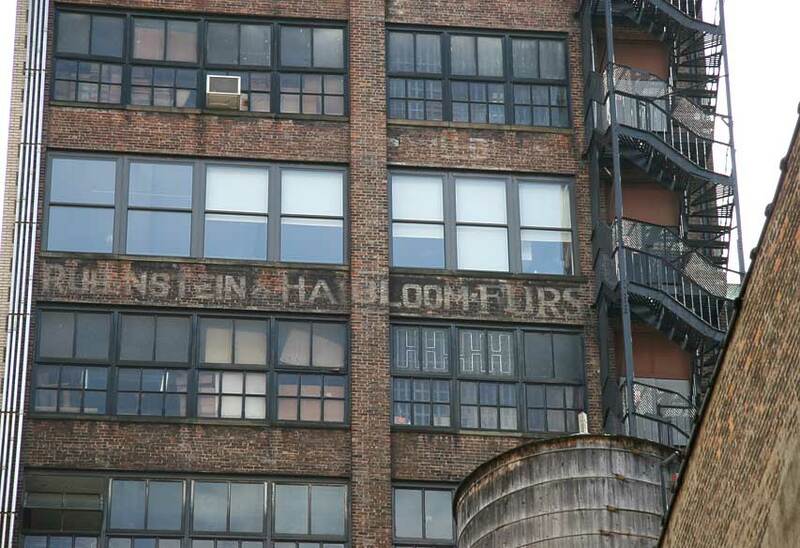 This sign for Rubinstein & Haibloom is located on the back of the building at 37-39 W. 28th St. as viewed from 29th St. Rubinstein was Hyman Rubinstein (1894-1978), and Haibloom was Abraham Samuel Haibloom (1894-1979). Both were natives of Krakow, Austria (now Poland). Haibloom immigrated in 1900, Rubinstein in 1913/14. Before there was a Rubinstein & Haibloom there was Jacobs, Rubinstein & Co. at 37 W. 28th St. in the early 1920s. The partners were Hyman Jacobs, Hyman Rubinstein and Abraham Haibloom. In 1924 this became Rubinstein & Haibloom. The business stayed only until 1927, when they moved to 151 W. 30th St. where they stayed until 1937. A photo by Percy Loomis Sperr (1890-1964) dated 1927 showing a Rubinstein & Haibloom sign at 151 W. 30th St. can be found on the New York Public Library's Digital Collections. The company remained in business at several locations in the garment area until the mid-1950s when the partners separated. Rubinstein soon went out of business, but Abe Haibloom survived until around 1970.